I was interested in examining the effects of military load carriage on the vertical ground reaction forces for my master’s thesis. The effects of military load carriage on the vertical ground reaction forces have been clearly established; however, the majority of the current studies investigated sample populations that were not experienced with military load carriage and portrayed the participants as a representative sample population of inexperienced military recruits entering basic training. The current studies have indicated that increased load carriage and load distribution are capable of altering lower extremity biomechanics and the gait patterns observed during conditions representative of basic training; whereas, more significant alterations would be expected for a condition resembling an advanced military training program, hypothetically placing infantry soldiers participating in advanced military training at an increased risk of sustaining lower extremity overuse type injuries. Considering that The Citadel is in fact a military college, presented a unique opportunity to recruit participants that are contracted in the Army ROTC program and experienced with military load carriage. To investigate the effects of military load carriage on vertical ground reaction forces, I designed three experimental conditions representative of the minimum requirements imposed by an advanced military training program, specifically the Expert Infantryman Badge. Vertical ground reaction forces refer to the external forces that are transmitted to the bones and joints of the lower extremities in response to the foot contacting the ground. In order to measure vertical ground reaction forces during human movement, a force plate or instrumented treadmill is required; however, force plates and instrumented treadmills are rather expensive, especially for a graduate student. So, I decided that I would build the equipment myself. Luckily, I stumbled across the Tacuna Systems website one night and requested some additional information as it pertained to my research. I received a response quickly and was introduced to Chris Lange, who provided an immense amount of help and was willing to take the time to answer all of my questions. First, I built a portable force plate in order to familiarize myself with calibrating the force plate and to ensure that the force plate was capable of providing reliable data. 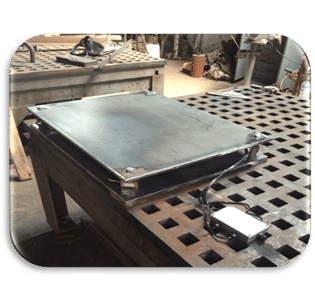 The portable force plate was constructed from two ½” thick steel plates measuring 30”x30” with four AmCells STL Series s-beam load cells sandwiched between the two plates. 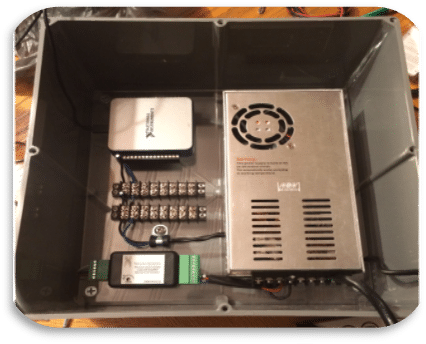 The load cells were summed in an ANYLOAD J04EA summing junction and were amplified with an EMBSGB200-M instrumentation amplifier from Tacuna Systems. The amplified signal was processed using a multifunction data acquisition device (USB-6002, National Instruments) and interfaced with LabVIEW. A custom LabVIEW virtual instrument was developed to measure the vertical ground reaction forces at 1000 Hz and filtered using a Butterworth low-pass filter with a 40 Hz cutoff frequency to remove any noise from the voltage signal in preparation for analyzing the data. Next, I built the instrumented treadmill, which accommodated a force plate that served as the treadmill running deck. The treadmill frame was constructed with 1530 series t-slotted extruded aluminum and the embedded force plate was constructed from a ½” thick steel plate that measured 24”x48”. The embedded force plate utilized the same components as the portable force plate, as previously mentioned. However, the load cells were attached to the corners of the steel plate and horizontal treadmill supports, enabling the force plate to be positioned flush with the treadmill frame. The treadmill components and electronics were taken from a Horizon Fitness T101-04 treadmill and custom mounts were fabricated for the motor and treadmill belt rollers. I am extremely satisfied with components that I purchased from Tacuna Systems, which have proven to be reliable during calibration and preliminary testing. I have submitted my research proposal to my Institutional Review Board and I am currently awaiting approval before I begin to collect the actual data for my research. I would like to thank Chris Lange again for all of his help with how to properly wiring the electronics and interface the load cells with LabVIEW.